One of the greatest RPGs of all time could have been the first World of Warcraft. Today, BioWare is well known for quality RPGs such as Dragon Age: Origins and Mass Effect, but the company cut its teeth on a series called Baldur's Gate. The original game, which spawned an expansion pack, a sequel, and a sequel's expansion pack, was valued for incredibly deep single-player gameplay. But according to BioWare founders Ray Muzyka and Greg Zeschuk, it wasn't originally conceived as a single-player game at all. 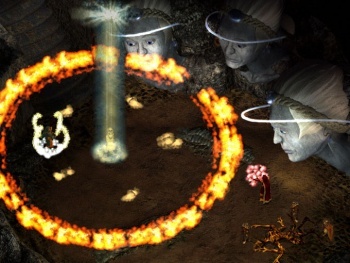 At GDC Europe 2010, the duo described the original title that Baldur's Gate's once was as Battleground: Infinity, a massively multiplayer online game. Muzyka described the concept as: "A pantheon of all these gods across all of these mythologies, it was crazy ambitious." At the time when BioWare was shopping Infinity around to publishers, the MMOG genre was still trying to grow out of its text-based, multi-user dungeon beginnings. Publisher Interplay saw Infinity's tech demo and suggested changing it into a Dungeons & Dragons licensed single-player game. This was a risk, with Zeschuk admitting "the RPG genre was pretty much dead in America; people would actually scoff when you said you were making an RPG," but the doctors took Interplay up on the new concept anyway. Thankfully, Diablo was released in 1997 and brought the action-RPG into mainstream consciousness, which gave BioWare the motivation to try the same with the traditional RPG. Baldur's Gate is still easily one of my favorite games ever, so I'm very happy it was never turned into an MMOG. I'm confident that if BioWare was left to its own devices in the mid-1990s and created an online game that could be played for 60 hours a week, I would have been playing it 75. Thanks, BioWare, for not destroying my life, and simply enriching it with the Baldur's Gate series instead. It's a very good thing for the world's productivity that BioWare is sticking to single-player games and not highly funded MMOGs based on Star Wars or anything.